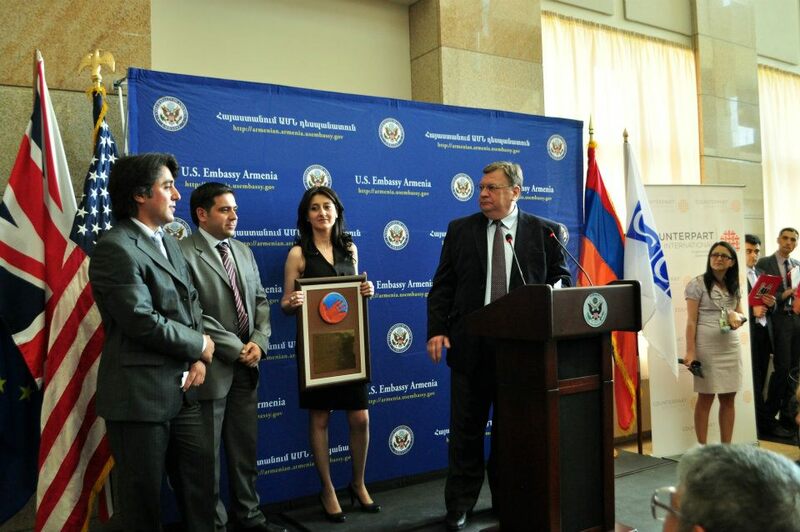 U.S. Secretary of State, Hillary Clinton, joined the U.S. Embassy, Counterpart International, the British Embassy, the OSCE, and the EU to honor individuals working to promote human rights, accountable governance, and free speech in Armenia at the Universal Rights Awards Ceremony at the U.S. Embassy in Yerevan. Secretary Clinton delivered remarks at the event and met privately with the award recipients. The Universal Rights Awards Ceremony was the first multi-mission initiative to highlight the contributions of Armenia’s civil rights activists, government officials, and media representatives to the promotion of human rights. 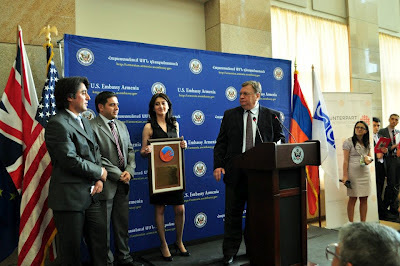 Armenian government officials, foreign diplomats, NGO representatives, and the press attended the event. Well deserved Awardees. Big congrats!! 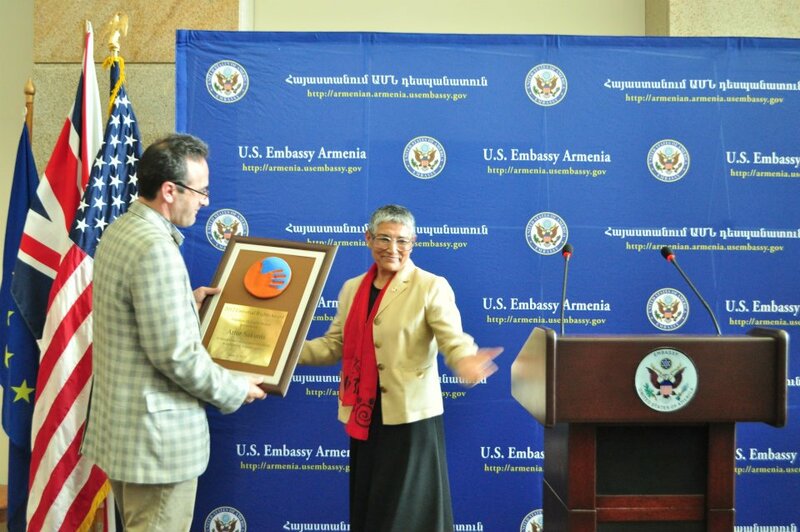 USAID/Armenia Mission Director, Jatinder Cheema, opened the ceremony and awarded Artur Sakunts with the Freedom Defender Award. “Artur defends all minorities, especially those that are the target of intolerance, such as ethnic, religious, and sexual minorities. He is not afraid to take unpopular stances, working constantly for a more tolerant Armenia,” said Director Cheema. 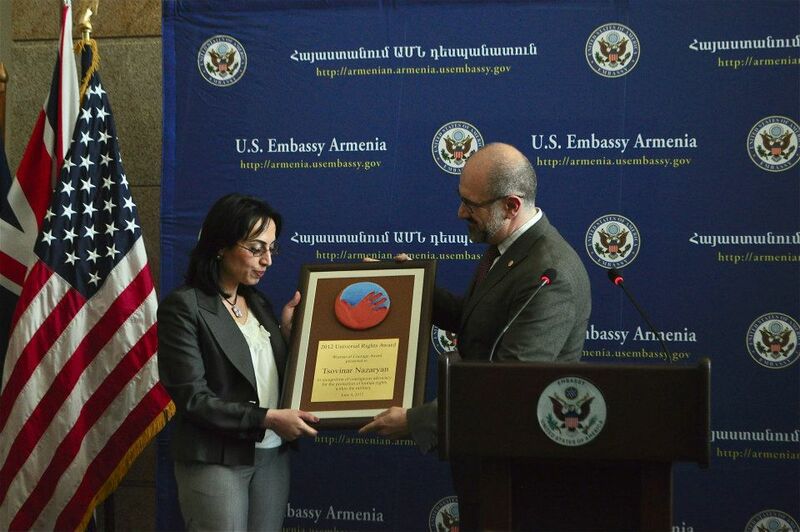 Counterpart International’s Chief of Party, Alex Sardar, presented the Woman of Courage Award to Tsovinar Nazaryan for her military reform efforts. “Tsovinar should be proud of her role in encouraging the military to embrace reform, which will lead to a more modern, effective, and humane force for Armenia,” Mr. Sardar said. 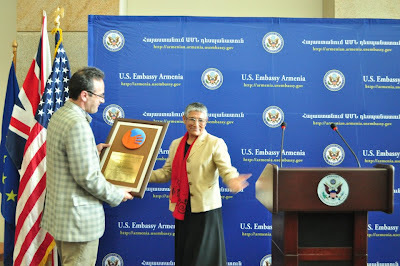 During meeting with Secretary Clinton, that followed the awards ceremony and lasted 20-25 minutes, the awardees managed to raise in more details some of the pressing issues re human rights in Armenia, including attacks on sexual minorities and rights groups that defend their rights, says Artur Sakunts in an interview with 1in.am (AM).